Christi Friesen Book 5 "Down Under"
Home / Christi Friesen Book 5 "Down Under"
G'day! In this fifth book in Christi Friesen's "Beyond Projects" series, you will have a clayfully good time making polymer koalas, kangaroos, echidnas, gum tree leaves and flowers and lots more. Christi's warm writing style and helpful nudgings will stir up your creativity and imagination. 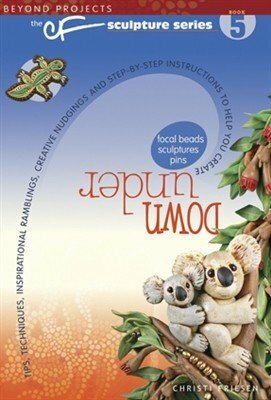 Techniques include adding beads, stones and crystals to your designs, simple caning, color mixing, stylizing and surface treatments. Part project, part travelogue -- all fun! Crikey!